Many peculiar delights are eaten in Los Angeles County, but diners might want to reconsider the fare offered at The Metro Supermarket. While it’s apparently not illegal to sell raccoons for consumption, it could become dangerous when the Guardians of the Galaxy learn of the practice. In one of the year’s most successful blockbusters, Guardians of the Galaxy, we were introduced to Rocket Raccoon. 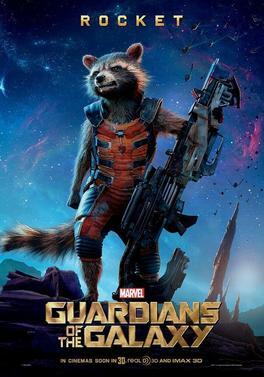 Rocket is a genetically altered Procyon lotor designed to be a deadly fighting machine. Not only is he a brilliant tactician, the genetic manipulations have left him with one bad attitude. Which makes it all the more important for the customers who purchase the ten-dollar-a-pound frozen raccoon carcasses to be cautious. On a more serious note, the question of what we eat is not merely academic. I’m not referring to modern insights into healthy diets. I’m talking about international, and potentially intergalactic, relations! World travelers are often introduced to foods that seem, to put it gracefully, exotic. On such occasions, some respond enthusiastically—eager to sample alien delights. Others are somewhat more wary—reluctant to place in their mouths things they cannot quite identify. Back in the 1980s I resided for a year in the Republic of Korea. I declined to eat gaegogi, not because I assumed dog meat would be unpalatable, but because I could not imagine contributing in any way to the slaughter of dogs for their flesh. Another time that year, a sergeant who worked at our chapel purchased a paper cone full of toasted rice during an outing. When he was done with the rice (burned, he thought, rather than “toasted”), his Korean girlfriend clarified that he had just devoured a cup of rice beetles. Military members stationed abroad are encouraged to be respectful of the cultures they encounter. And those cultures included different foods. We need not travel to other nations to experience this diversity. I grew up in a family which considered processed “fish sticks” to be seafood. Combined with canned tuna fish and an occasional canned salmon “patty” it constituted the whole of my exposure to the abundance of the sea. While I have since that time expanded my tastes to include many types of fresh fish, I must admit that crustaceans are not among my favorite foods. And, well, let’s not even talk about those creatures that have tentacles . . . Showing respect to others by dining as they do, is not a new concept. The early Christians were advised to eat without reluctance food that may have been sacrificed in a pagan temple, without questioning their hosts as to its source. “If one of the unbelievers invites you to dinner and you are disposed to go, eat whatever is set before you without raising any question on the ground of conscience” (1 Corinthians 10:25, ESV). C.S. Lewis enjoyed a good meal. And he wrote many times about eating. Here are two of his insights on the subject. For eating and reading are two pleasures that combine admirably. Of course not all books are suitable for mealtime reading. It would be a kind of blasphemy to read poetry at table. What one wants is a gossipy, formless book which can be opened anywhere. (Surprised by Joy). A man who is eating or lying with his wife or preparing to go to sleep in humility, thankfulness and temperance, is, by Christian standards, in an infinitely higher state than one who is listening to Bach or reading Plato in a state of pride. (Letters of C.S. Lewis). Those interested in learning more about how Lewis approached the subject of meals in his fiction should download a copy of a doctoral thesis on the subject. Lower Sacraments: Theological Eating in the Fiction of C.S. Lewis is available for free here. We’ll close with the following words from the newly minted “doctor’s” abstract to his dissertation, citing some of the subjects he explores. For years, critics and fans of C. S. Lewis have noted his curious attentiveness to descriptions of food and scenes of eating. Some attempts have been made to interpret Lewis‘s use of food, but never in a manner comprehensively unifying Lewis‘s culinary expressions with his own thought and beliefs. My study seeks to fill this void [proposing] ecclesiastical themes appear whenever Lewis’s protagonists eat together. The ritualized meal progression, evangelistic discourse, and biographical menus create a unity that points to parallels between Lewis’s body of protagonists and the church. . . .
Lewis’s meals which are eaten in the presence of the novel’s Christ figure or which include bread and wine in the menu reliably align with the Anglo-Catholic doctrine of the Eucharist. . . . sinful eating affects the spiritual states of Lewis’s characters. I love that phrase, “gastronomic Fall of Humanity.” I’m not sure I can work it into a sermon someday, but only time will tell. Until then, I have to be content to regard the eating of dogs—and probably raccoons as well—as consequences of humanity’s Fall. And I will look forward to the new creation when all such things will have passed away. He’s a neat character, for sure. Being the only one of his kind, though, made him a terribly lonely figure… until the Guardians found each other. Of course, he had Groot before that, but Groot has a difficult time holding up his end of a conversation. I have to admit one of my favorite food passages in books is the description of Ransom’s first taste of the fruit in Perelandra! That certainly is an extremely memorable scene. In many ways… swashbuckling, heroic, sacrificial, redemptive… I’m looking forward to the sequel.